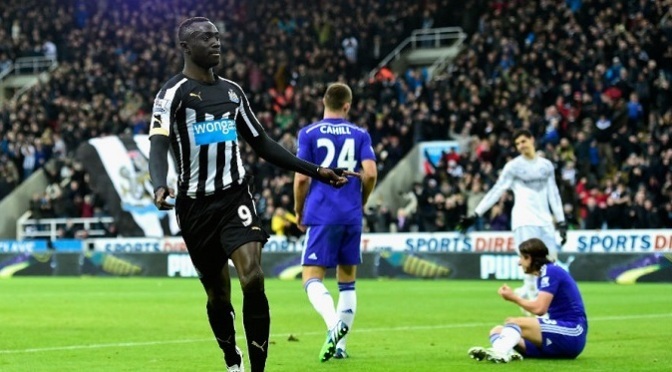 Chelsea suffered their first defeat of the season as Papiss Cisse’s double condemned them to a 2-1 defeat at Newcastle United. Chelsea made the brighter start, but they failed to take advantage and allowed the hosts to grow into the first half, with Jack Colback threatening an opener. Newcastle had to bring on rookie goalkeeper Jak Alnwick at the break after seeing Rob Elliott succumb to injury. The setback did not appear to trouble them, though, and they found themselves ahead on 57 minutes when substitute Cisse turned home a cross that Gary Cahill had failed to clear. Cisse then looked to have settled it when he netted his second on 78 minutes as Newcastle broke away on the counter after Eden Hazard hit a post, but the match then took a dramatic twist. First, Steven Taylor collected a second yellow card for a foul on Andre Schurrle and then Didier Drogba headed home from Cesc Fabregas’ free kick on 83 minutes. The visitors applied heavy pressure as they desperately sought an equaliser, but Newcastle held firm for a memorable victory. Ruthless Chelsea extended Tottenham’s torment at Stamford Bridge with a 3-0 win which saw Jose Mourinho’s unbeaten Blues consolidate their lead at the top of the Barclays Premier League. Spurs were bidding for a first win at their rivals’ west London home since February 1990 at the 28th attempt and began well, with Harry Kane hitting the crossbar with an early header. There was a sense the visitors had to take an opportunity when enjoying the early supremacy and their failure to do so was punished by two goals in four first-half minutes through Eden Hazard and Didier Drogba. Drogba, deputising for suspended striker Diego Costa, returned a pass to Hazard, whose shot squirmed under Hugo Lloris to give Chelsea a 19th-minute lead. Worse was to follow for the France goalkeeper as his dreadful clearance went straight to Hazard, who found Oscar, with the Brazilian playing the kind of pin-point pass Drogba relishes. The striker’s fifth of the season – and 162nd Chelsea goal – effectively ended the match as a contest and ensured Mourinho’s men would extend their unbeaten start to the season to 21 matches ahead of this weekend’s trip to Newcastle. Substitute Loic Remy embarrassed the hapless Jan Vertonghen in netting Chelsea’s third to complete a comfortable victory. It was not all positive for Chelsea as Nemanja Matic will miss the trip to St James’ Park through suspension after picking up his fifth booking of the campaign, while Gary Cahill could be a doubt after going off at half-time following an earlier clash of heads. Chelsea, who lost at Newcastle last season, remain six points clear of second-placed Manchester City, the defending champions, with Spurs 16 points adrift in 10th. Tottenham, who play Crystal Palace on Saturday, will hope to climb the table before their next contest with Chelsea, on New Year’s Day at White Hart Lane. Chelsea had failed to score for the first time this term in drawing last Saturday at Sunderland, while Spurs, who lost 4-0 at Stamford Bridge in March, travelled in optimistic mood following Sunday’s 2-1 defeat of Everton. Gary Lineker scored the winner when Spurs last won at Stamford Bridge and Kane, born more than three years after that victory, appeared to be on a crusade to emulate the England striker turned Match of the Day presenter. Cahill appeared groggy after a clash of heads with Vertonghen and was then caught napping as Kane stole a yard on him to meet Aaron Lennon’s cross. The striker’s header beat Thibaut Courtois, but bounced back off the woodwork. Kane then dispossessed Cahill on the left wing and ran into the area before firing across goal as Spurs spurned another opportunity. Chelsea stepped up a gear. John Terry surged to win the ball down the left and fed Willian, who in turn found Drogba. The striker teed-up Fabregas, whose attempted curling shot was held by Lloris. Again Chelsea attacked down Spurs’ right as Hazard turned Lennon before finding Drogba, who had his back to goal and held off Federico Fazio with ease. Lennon neglected to follow the run of Hazard, whose shot beat the unconvincing Lloris at the near post to give Chelsea the lead. Lloris then presented Hazard with the ball midway inside the Spurs half. Two passes later it was 2-0. Hazard played it centrally to Oscar, who threaded the ball through to Drogba, who shook off the attentions of Vertonghen and finished with aplomb. Drogba needed assistance in departing the field at half-time, but did return for the second half. Cahill did not, with Kurt Zouma on in his place. Spurs failed to test Kurt Zouma in what had almost turned into a defensive drill for Chelsea, who were content to play on the counter-attack. Speculative shots were about all Spurs could muster and manager Mauricio Pochettino turned to his bench, with Paulinho and Nacer Chadli replacing ineffective duo Mason and Lennon. Tottenham still lacked energy and were being outplayed by a 36-year-old veteran. Drogba was unable to direct Hazard’s fizzing pass towards goal and, despite appearing laboured, managed to out-muscle Fazio before firing straight at Lloris. The Ivory Coast striker was then granted his leave as Remy came on with 23 minutes to go. The France striker made his mark six minutes later, receiving the ball in the left channel before brushing off Vertonghen and passing into the corner to complete the rout. Robin van Persie’s equaliser deep into injury time gave Manchester United a point and kept Chelsea within range of their Premier League title rivals after a dramatic Old Trafford finale. Didier Drogba’s header, glanced in off Van Persie early in the second half, looked to have extended Chelsea’s lead at the top of the table to six points until a thunderous conclusion in front of the Stretford End. In scenes reminiscent of days gone by at the Theatre of Dreams, Chelsea’s Branislav Ivanovic was shown a second yellow card for a foul on Angel Di Maria as United applied late pressure. Di Maria’s resulting free-kick saw Chelsea goalkeeper Thibaut Courtois save brilliantly from Marouane Fellaini but Van Persie was on hand to thrash home the rebound and spark wild celebrations around Old Trafford. Blues manager Jose Mourinho turned away in disgust as Van Persie scored, frustrated that the victory his side deserved for controlling long periods had slipped away in a chaotic conclusion. The Portuguese’s side remain four points clear of second-placed Southampton – and, perhaps more significantly, six points ahead of last season’s champions Manchester City – but this is a result that will almost have the after-taste of defeat, even though Chelsea’s unbeaten run continues. Without injured top scorer Diego Costa, the old warrior Drogba stepped into the breach and, when United did threaten Chelsea’s defence, keeper Courtois was faultless. The Belgian was powerless to prevent Van Persie’s leveller. Despite the late concession, Chelsea looked ominously powerful and carry all the hallmarks of the team to beat this season. scored his first goal since rejoining Chelsea as they recorded their biggest Champions League win with a dominant victory against Maribor at Stamford Bridge. 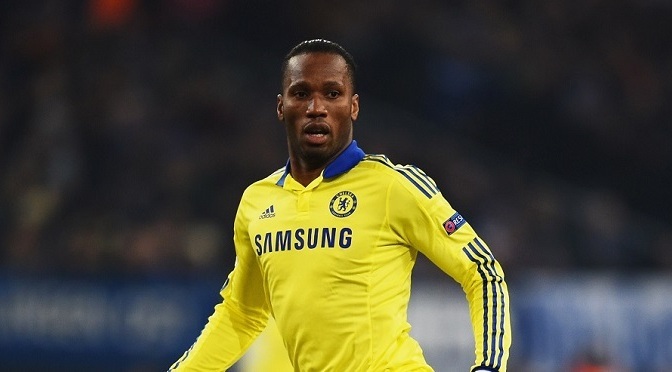 With Diego Costa out with a hamstring injury, the Blues could face Sunday’s Premier League trip to Manchester United with Drogba as the club’s only fit first-team striker.